If you’ve been following The Book Chook for a while, you have probably picked up that I love books that are also puzzles or toys. Why? Because I think these books are not only great entertainment, but often bridge the gap for children who may think they don’t like to read. I believe that getting books into kids’ hands, having them learn to love books and reading, is paramount. We can guide them to an appreciation of more densely textual literature later. 100 People by Masayuki Sebe was published by Gecko Press in 2013. Gecko Press is a New Zealand company that specialises in “curiously good books from around the world.” They have also published Sebe’s Dinosaurs Galore and 100 Things. It’s time to start playing hide-and-seek! Are you ready? Find the pirates, the kings, the schoolchildren and more! Sebe’s graphic design in this children's picture book is bold, simple and quirky. I can see kids appreciating the simplicity of the people portrayed, and using the art work as fuel for their own creations. There are lots of details to pore over, with a main set of questions for each spread, but many extra things to read about in the speech bubbles, and find too. The scenes are different - 100 cave people, 100 tree climbers - and very dynamic, with little interactions to explore and exclaim over. I love this book! It will make an excellent acquisition for schools. A class could look at a double page spread at a time, discussing the illustrations in all their glorious graphic detail, reading and answering the questions, and making up new questions of their own. Innovating on 100 People will make a fun class project. Kids could each contribute a page of their own after lots of discussion and planning. Children lucky enough to receive this book as a gift will enjoy it as is, but also have a ball sharing it with a friend. 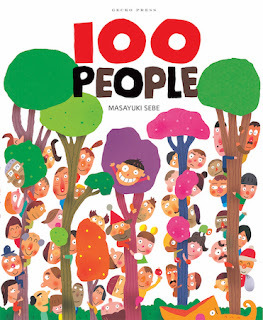 Such books as 100 People are made to be shared!